Over the past 10 days I’ve found myself forced into a wee bit of an existential quandary. While that might sound over the top, it seems to me a perfectly adequate reaction given what was unfolding. Last week, out of nowhere, I found out that our governing body (the International Association of Athletics Federations) would be voting on a proposal to scrap the 50-kilometre race walk from the Olympic program in 2020 (Spoiler alert: the walk survives for another Olympic cycle). The walks community, lacking in full details of what was unfolding (as it had all gone on behind our backs) but also lacking much more significantly in time, organized, and within a couple of days had our voice loud and unified. While we were battling publicly for our event, I was pondering privately, trying to come to terms with the IOC’s rationale for wanting to get rid of race walk and wondering what, if any, value I bring to the table as a race walker. The IOC provided several reasons for getting rid of race walk. Some, like gender equality, are valid (although easily fixed by incorporating a women’s 50k, following the IAAF’s lead this year). Other reasons, such as: it takes too long, it is too hard and too costly to close the one kilometre of road the race occupies, and it doesn’t appeal to a younger audience for television are, in my biased opinion, completely misguided. Basically, the IOC doesn’t like that it can’t make money off the event (my words). The IOC is charged with upholding the values of the Olympics, as defined in the Olympic Charter but the modern Olympics have strayed so far beyond the charter’s intention that the IOC now finds its actions and responsibilities at odds with each other. My friend and training partner Quentin Rew wrote in eloquent detail about the Olympic hypocrisy. So just how does race walk fit into these Olympic values that the IOC is supposed to uphold? What kind of value is there in an event requiring minimal infrastructure and representing the most basic of human movements, something billions of people do every day? The walk requires peak physical conditioning combined with a will to endure for nearly four hours. This ability to endure is not done seeking fame or glory (we know we aren’t the event for that) rather, it stems from a passion to push our limits and find out what our potential is. When you consider that the walk is also a free event at the Olympics, occurring on just one kilometre of closed road, it is easy to see how our event can take these Olympic values and showcase them first-hand to an audience that couldn’t otherwise afford to see them, in the highly capitalistic Games we have now, wherein watching Usain Bolt run for 10 seconds will cost you several hundreds of dollars. The Olympic symbol, the five interlaced rings, represents the unity of the five continents. The 50km walk in Rio was one of only two athletic events in which the top-four finishers each represented different continents. It is an accessible event, requiring no more than a pair of shoes (and some guys I’ve raced against don’t even wear those). This worldwide representation and accessibility are two further principles of “Olympism.” The Olympic Spirit is defined as “a spirit of friendship, solidarity and fair play.” In my 16 years as a race walker, aspiring to Olympic success, I feel like I have grown to embody these values. And I believe the race walking community as a whole has these values in spades. You don’t have to look very far to find the impact of friendship in the race walking community. We mounted a three-week high fat diet study eight months before the Olympics, and brought two dozen athletes from a dozen countries and every continent together to train, hang out and make each other better. That is a testament to friendship among race walkers. At the end of the day, we are out to win, but we celebrate the successes of those around us as much as we celebrate our own victories. When I do school talks, the one thing that resonates most with kids is how many countries I have been to, and how many friends I have made from all around the world. Furthermore, and there is no way to say this humbly, but I think there are few greater authorities to speak to the value and importance of fair play in sport right now than me. But one thought that makes me very happy is knowing that almost everyone in the race walking community, if faced with the same decision that I was on whether to appeal for a chance at a medal, would have made the same decision I did. And that is the Olympic spirit in action. Personally, I think my sport manifests its greatest value directly in the community. I train for several hours a day on the streets, doing a movement that makes me uniquely visible. I see hundreds if not thousands of people every day, many of whom know my name, know my story and cheer for me. I believe that when people get to see others striving for excellence in anything it inspires them to do the same. There are not many other sports in which the athletes are so visible on a daily basis in their wider community. 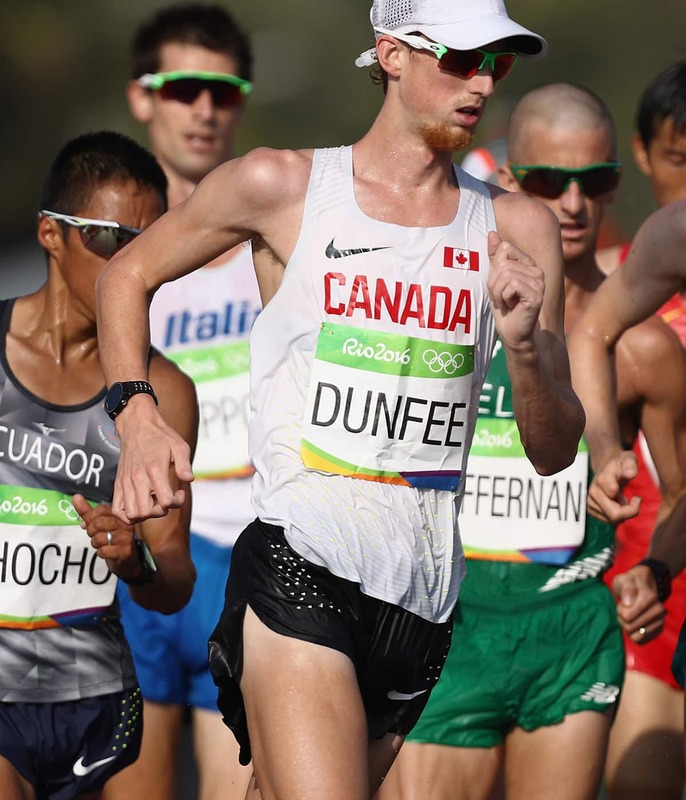 For Dunfee, there is room for sportsmanship in competition. I would be naïve not to understand the position of my event. It is a little weird, it looks funny, and not a lot of people care about it. However, I think that is part of the reason I was drawn to it so strongly as an 11-year-old. I was weird, I looked funny, and I thought know one cared about me. If race walking can provide the same kind of outlet and opportunity for a kid that feels the same way I did, and carry them 16 years to a point where they are inspiring a community, I can’t see how that alone does not justify its worth in the Olympics. I understand that race walk is never going to make the IOC millions of dollars. But the value of the event and the value of the athletes in a wider context of what they can offer, how they can inspire, and how they represent the Olympic spirit so truly that value cannot be measured monetarily. We may have won the first battle, with the IAAF deciding not to axe the 50km from the 2020 program, but our fight with the IOC to prove that we belong continues. I can’t thank people enough for the support they have shown our community over the last week. It has really helped cement my belief. What I have said here is true, and it is worth fighting for.